Join us on Costa Rica's Pacific Coast. A paradise where the jungle meets the sea. We'll take over a lush secluded retreat center for 6 days & nights of making art, nurturing relationships with other women, and adventuring in the jungle paradise of the Nicoya Peninsula in Costa Rica. Our group will lodge in a private villa compound with our own pool and secret path to the beach surrounded by jungle, falling asleep to the sound of the surf. Each morning after a delicious breakfast served by our house cook, there will be optional yoga or surf lessons with our private instructors to begin our day. 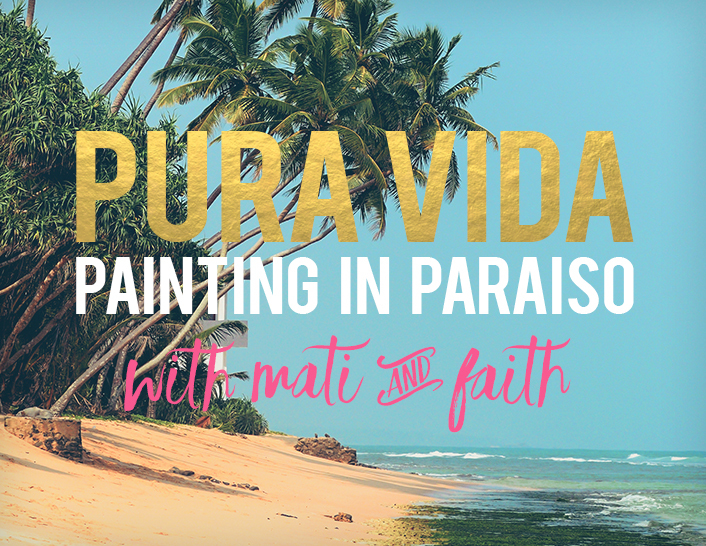 After morning beach time Mati Rose McDonough and I are teaming up to take you on a layered painting adventure, we'll dive into lessons on our gigantic open air painting porch filled with hammocks, comfy couches and tables for us to paint on. We will begin each day diving into layers of Watercolor for our Watercolor warm ups practice. 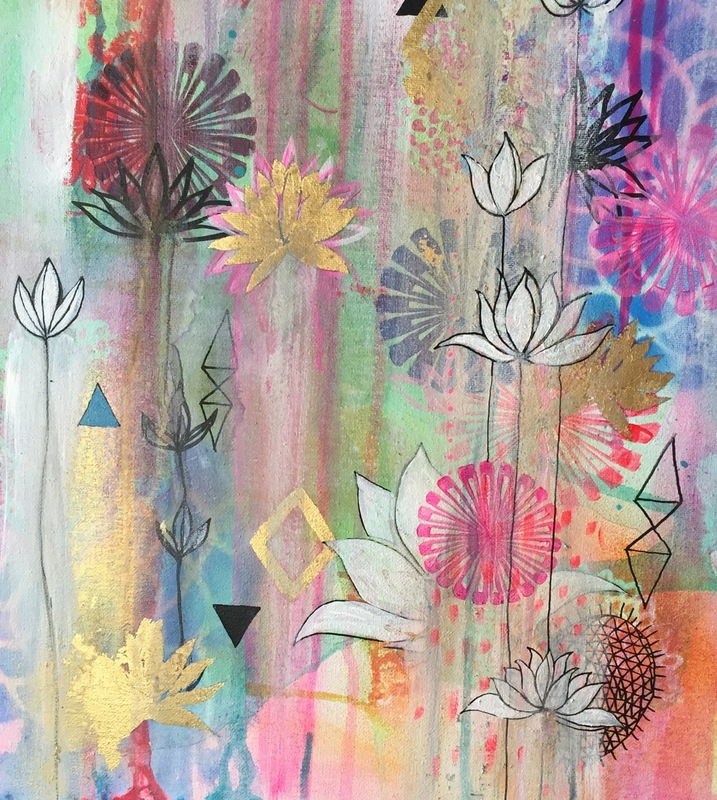 Then in daily acrylic painting workshops we'll lead you through many topics including collage, working with stencils, silk screening, spray painting, gold leafing, layering with drips and washes, incorporating geometrics, and creating abstract layers along with painted Mandalas and Feather Power Girls! At the end of our time together you'll leave with at least 2 finished paintings and tons of new skills under your belt to invigorate your painting practice back home! All of our painting lessons will be based on our book Painting The Sacred Within! This is our 5th retreat at our Jungle Beach House location, its like our own private jungle tree house, with a secret path to the sea! We will have inspiring Ayurvedic Bodyworker Lara Cornell with us to lead our group in 3 gentle morning yoga sessions. Lara will also be offering private flower essence consultations and ayurvedic facials with flower essences for each retreat participant. With the consultations each person will get their own special grounding blend elixir of flower essences to take home. Visit our rooms & rates. NESTLED IN ITS OWN PRIVATE GARDEN OASIS, THE JUNGLE BEACH HOUSE IS AN AMAZING GROUP RETREAT; MADE UP OF THREE SEPARATE BUILDINGS IN A WALLED COMPOUND FULL OF FLOWERING GARDENS AND PATHWAYS, WITH A TOTAL OF 8 BEDROOMS, THIS UNIQUE PLACE IS WHAT VACATIONING IN THE TROPICS IS ALL ABOUT! THIS HIDDEN GEM IS LOCATED WITHIN THE HEART OF THE SLEEPY BOHEMIAN BEACH TOWN OF NOSARA, IT IS THE PERFECT LOCATION FROM WHICH TO EXPLORE THE AREA ON FOOT. THREE GUEST ROOMS ARE SINGLE OCCUPANCY, OTHER GUEST ROOMS ARE DOUBLE OCCUPANCY. THE JUNGLE BEACH HOUSE HAS ITS OWN PRIVATE PATHWAY TO THE BEACH (JUST A MINUTE WALK) SO FALLING ASLEEP TO THE SOUNDS OF THE SURF IS A DEFINITE. THERE IS ABUNDANT WILDLIFE HERE, YOU'LL OFTEN HEAR THE SOUNDS OF MONKEYS IN THE JUNGLE NEARBY, IGUANAS RUNNING AROUND THE PROPERTY, AND SO MANY BIRDS TO WELCOME YOU INTO EACH DAY! 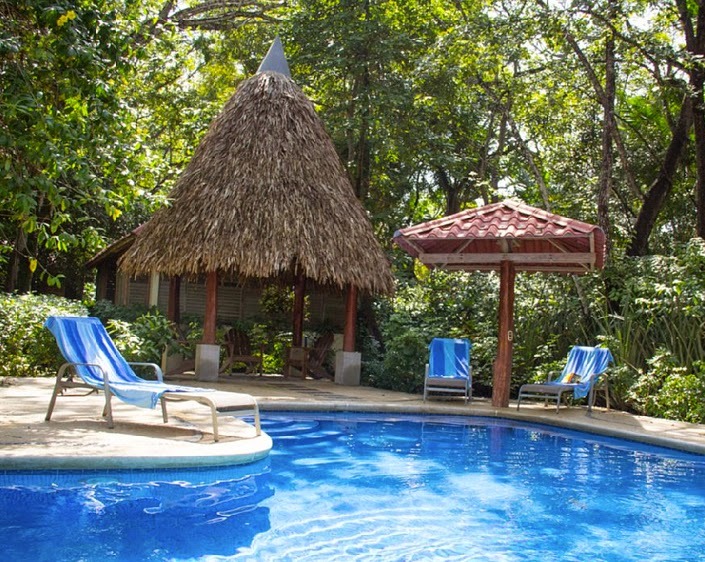 THIS LARGE PROPERTY IS VERY PRIVATE, IT COMBINES AUTHENTIC CHARM AND A TROPICAL ATMOSPHERE. ENJOY THE DIFFERENT RELAXATION SPACES THE JUNGLE BEACH HOUSE OFFERS. 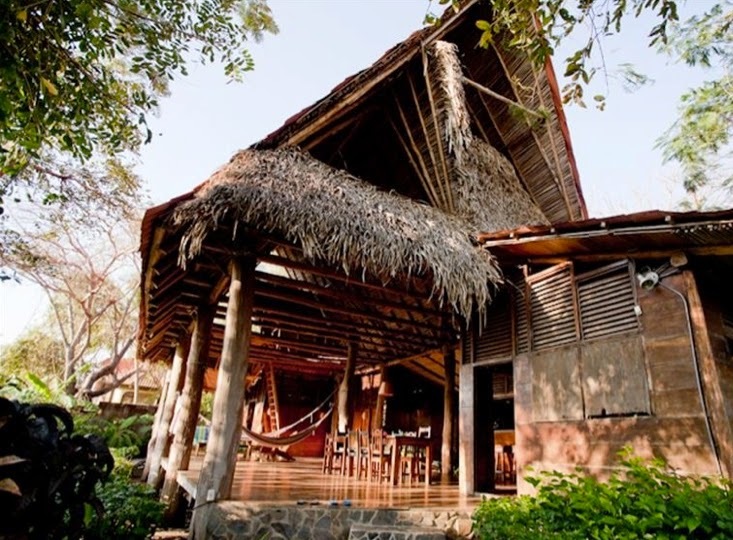 THE PRIMARY GATHERING AREA IS IN THE PROPERTY'S OLDEST BUILDING, THE RANCHO, A RUSTIC STRUCTURE WITH SOARING CATHEDRAL CEILINGS UNDER ITS THATCHED ROOF, BUILT IN THE TRADITIONAL LOCAL STYLE. THE SIDES OF THE RANCHO ARE OPEN TO THE OUTDOORS WITH SOUL. IT HAS A GIGANTIC OPEN AIR PORCH WHICH WILL BECOME OUR OWN PRIVATE JUNGLE STUDIO SPACE FOR THE LENGTH OF OUR STAY, COMPLETE WITH HAMMOCKS AND COMFY COUCHES, A LIVING ROOM, CONVENIENT BATHROOM AND LARGE KITCHEN. THE PRIVATE POOL AREA IS EQUIPPED WITH LOUNGE CHAIRS & TOWELS, GIVING YOU THE OPTION TO UNWIND IN THE SUN OR IN THE SHADE OF ONE OF THE THATCHED ROOF PALAPAS. IN ADDITION TO THE SPACIOUS LOUNGE AREAS, THERE ARE FIVE DOUBLE-OCCUPANCY, AND THREE SINGLE OCCUPANCY, GUEST BEDROOMS SPREAD THROUGHOUT THE 3 BUILDINGS ON THE PROPERTY, ALL WITH SHARED OR PRIVATE EN-SUITE BATHROOMS. THE RANCHO BUILDING AND OTHER COMMON AREAS WILL ACT AS OUR CENTRAL MEETING SPACE FOR RELAXING, GATHERING, ART MAKING OR EATING. THIS CENTRAL OPEN AIR SPACE OFFERS US A BEAUTIFUL EXOTIC ATMOSPHERE IN WHICH TO CREATE ART IN PARADISE! $600 NON-REFUNDABLE DEPOSIT REQUIRED TO HOLD YOUR SPOT. TOTAL BALANCE IS DUE JANUARY 15TH, 2018. PAYMENTS PLANS ARE AVAILABLE, PLEASE SEE FAQ'S BELOW FOR DETAILS. TO SEE RATES AND CHOOSE YOUR ROOM CLICK ON THE BUTTON ABOVE. ONCE WE RECEIVE YOUR DEPOSIT WE WILL BE IN TOUCH AND SEND YOU TIMELY UPDATES AND TRAVEL TIPS AS NEEDED. What's the typical day like at the Jungle Beach House? Arrival, settle in, explore the sweet hippie town of Nosara and enjoy the beach and pool. Opening Circle and Welcome Dinner at the Jungle Beach House. Breakfast, Morning Yoga, beach time. Walking tour of the area, we'll show you all the best spots to get a smoothie, a massage, our favorite restaurants & shopping. Afternoon Watercolor warm ups & abstract painting with Faith. Buffet catered lunch. Painting & free time. Breakfast, beach time, Surf Instruction with our private instructor. Watercolor warm ups & abstract painting workshop with Mati. Buffet catered lunch. Flower Essence Consultations with Lara Cornell. Painting & free time. Group dinner at fabulous local restaurant La Luna! Breakfast & Buffet catered lunch. Morning Surf Instruction with our private instructor! Then you've got a Free Day to enjoy all that this beautiful part of Costa Rica has to offer...horseback ride on the beach, go on a ziplining adventure, sink deeply into relaxation with a massage, surf, go deep sea fishing, take a jungle hike, all are close by! You can also choose to simply stay at the jungle beach house and paint your heart out, its all up to you! Breakfast, Morning Yoga, beach time. Watercolor warm ups & abstract painting with Faith. Nature Mandalas. Buffet catered lunch. Private individual Facials with Lara Cornell. Painting & free time. Breakfast, Morning Yoga, beach time. Watercolor warm ups & abstract painting with Mati. Buffet catered lunch. Evening closing circle and celebration! Breakfast & farewell. Shuttles will leave for the airport by 10am. Yes! Upon receipt of your $600 non-refundable deposit you may divide your remaining total into up to 2 separate payments. Total balance is due January 15th, 2018.
a gift bag when you arrive, full of goodies & gifts for you to use in your art making! 1 private flower essence consultation, and personalized special blend of flower essence elixir to take home, from Lara Cornell. around the clock access to our own open air art studio & art supply buffet, where you can let your inspiration run wild and work into the night if you desire. Create & explore with...paints, silkscreens, stencils, brushes. Students will be asked to bring along their own canvases, watercolor and acrylic paints. We'll send out a recommended supply list letting you know all that you will need to bring! private beach access, one minute walk down a private path to the most beautiful beach in the area! private swimming pool, surrounded by lounges....the perfect place to refresh, morning or afternoon. 3 mornings of centering yoga, (optional) led by our private instructor. 2 mornings of surfing lessons,(optional) led by our private instructor. Also as a bonus gift for our lovely retreaters: ~You'll receive a FREE year of access to Painting the Sacred Within: A Year of Exploration, Self Discovery & Finding Your Voice Through Painting; the year long online painting class with Faith & Mati (a $349 value). Your airfare and ground transportation are not included in the cost. Any meals eaten off the Jungle Beach House grounds (5 dinners). Expect to pay about $20-$30 depending on the restaurant for dinner. Anything you buy in the markets or on various trips will not be covered as well as any extra tours or excursions that you choose during your free time if you choose to go. 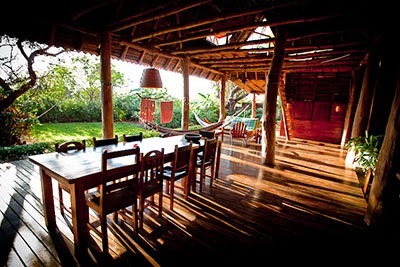 The Jungle Beach House is a luscious and intimate retreat space, we will have the entire property at our disposal. Each of their rooms are unique, make sure you choose the one that suites you best. Three of their rooms are single occupancy, which will be given on a first come first served basis (these rooms are sold out). Their other rooms are double occupancy with two beds per room. We will do our best to pair you up with someone we think you'll match well with. On our retreats the sharing of rooms has fostered close bonds of friendship within the group. The Jungle Beach House never uses processed foods and all meals are prepared the old fashion way – from scratch. Vegetarian options are available if we inform the cook before hand, gluten free can also be accommodated. They provide a fixed daily menu that relies on fresh and local ingredients. Lunches – light and fresh with lots of local flavor: fish, chicken, lots of veggies, rice and beans, plantains, tortillas, daily fresh pico de gallo, and the best guacamole we've ever had! Fresh fruit smoothies, juice, filtered water. How do I get to the jungle beach house from The airport and back again? The Jungle Beach House is located on Playa Guiones in the town of Nosara, about a 2 hour drive from the international airport. We can recommend a few shuttle companies for you to book a round trip shuttle from the airport, this is easy and can be done online. Once you book you will be added to our retreat's private Facebook group where women have arranged to meet up upon arrival and share airport shuttles! On our departure day all shuttles will depart for the airport by 10am. When booking your flight please fly into Liberia International Airport. We recommend booking your flights at least 90 days before the beginning of the retreat. Weather in April is likely to be in the high 80's. This is the dry season in Costa Rica, it is hot, humid and usually sunny with a possible passing shower. The Jungle Beach House is located on the beach so there is always an ocean breeze, however plan for hot weather! We take breaks often to jump in the pool or the ocean for refreshment. It is expected to be a bit cooler in the evenings with highs in the 70's and low 80's. We ask you to approach this trip with a sense of adventure in your heart. We think you are going to love this retreat! We encourage you to do a little research on the area before you come. Costa Rica has a vibrant friendly culture, this is the tropics with wildlife all around, dirt roads, heat and humidity. We will be outdoors painting in a covered open air studio, there will be shade but it will likely be hot. 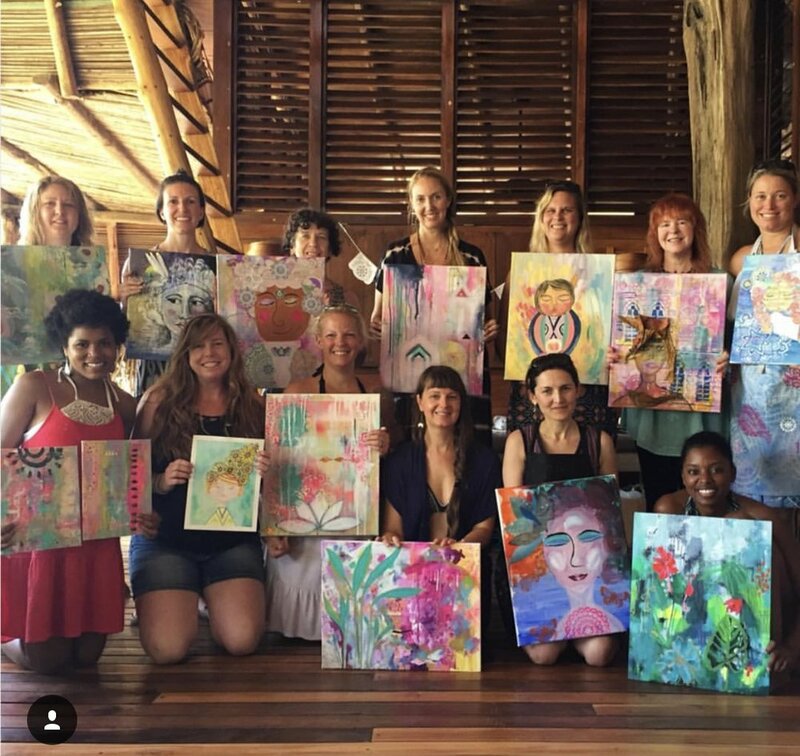 This retreat offers a chance to step outside of your day to day through experiencing a week immersed in topical lifestyle, feeling pampered with chef made meals, painting 24/7 as much as you want to dive into your art. We foster a welcoming atmosphere where we want all women to feel comfortable, appreciated and safe as they journey with us. We love that deep friendships form between the women on all of our retreats, getting to know creative women from around the world is one of the best parts! The retreat will be a mix of laid back down time, lots of painting, exploration, pampering and immersion into an exciting, lively culture. We will send you a supply list two months before the start of the retreat. We'll bring lots of fun supplies for you to play with on the retreat in our 24 hour art supply bar! You will bring your own canvases, a selection of paints and brushes that we'll recommend. We also recommend that you bring an extra bag (a collapsible duffle) to bring home your goodies you have collected on our shopping trips. Don't forget to pack a bathing suit and sarong, that might be all you want to wear! There will be no refunds for this Retreat due to the planning and logistics involved. When you register be sure to know all you can about traveling to Costa Rica. 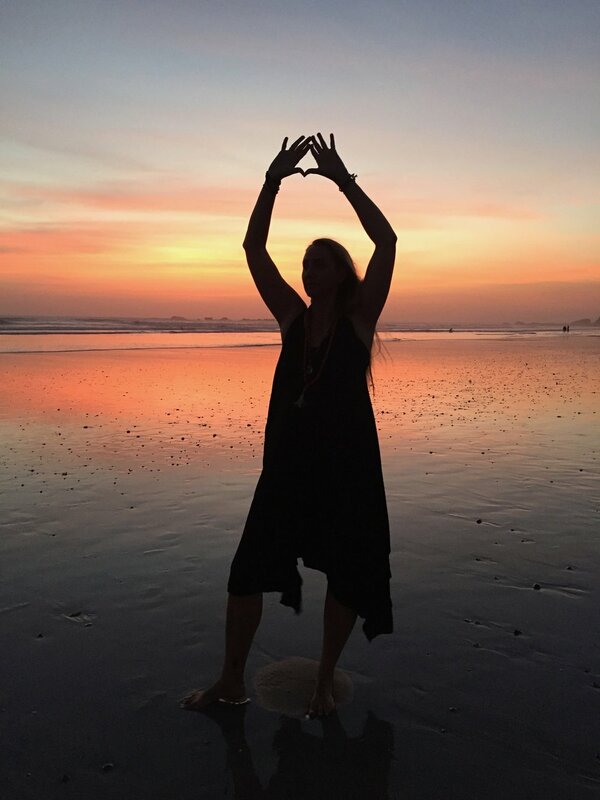 "This week in Costa Rica I focused on the practice of being wild hearted and learning how to let go. I'm so thankful for all of the women I got to spend time with and learn from, at the Pura Vida Retreat with Mati Rose and Faith Evans-Sills. I feel so blessed to call all of these ladies my friends. I didn't understand what holding space was before this experience but after feeling the unconditional love and acceptance and lack of judgement this week I've come away with an appreciation for creating an environment that nurtures others while they are on their journey. I'm excited to return home full of inspiration and ready to allow new learning to unfold with an open heart. "~ Christine B. "When people ask what my favorite memories are I can say it’s been traveling to beautiful destinations with Mati and Faith! I’ve gone to Costa Rica and Morocco with them and both trips have changed my life for the better! Not only are you discovering new places, but also exploring parts of yourself through art making. Being able to travel and create colorful artwork while making new friendships have been the most transformative and joyful moments in my life. If you want to be nurtured and truly feel awakened, I suggest their art retreats because they are 100% happiness! "~Lily U.